Turtle Rock Studios, the group responsible for the creation and much of the development of Left 4 Dead, has "got the band back together" after shifting away from Valve's ownership and will be releasing its next game for publisher THQ. 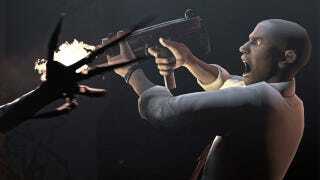 Having worked with Valve for years, first on the Xbox version of Counter-Strike and then Left 4 Dead, Turtle Rock was first acquired by Valve, renamed Valve South and then, after some staff movement, quietly just...faded away into the night as Valve's main studio worked on Left 4 Dead 2 by its lonesome. Well, now much of the original staff is back at a revamped Turtle Rock, and THQ has picked up the publishing rights to its new, major title currently slated for a 2013 release. It's some kind of multiplayer game, and is being shown at E3, so you won't have much longer to find out exactly what it is.